Dutch lap vinyl siding has been around since colonial days when it was appreciated for its superior resistance to water and air infiltration over the more common beveled wood siding. The siding features a unique profile that's scooped at the top to allow a tighter fit when the wood siding is nailed on a home. The scoop also creates well defined shadow lines after a home is completely sided. The siding style has had a loyal following over the years. 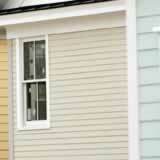 When vinyl siding became available for homes, Dutch lap was among the first styles offered. Siding prices can vary depending on the manufacturer and the area of the country you live in, but you should be able to add the beautiful shadow lines of Dutch lap vinyl siding to your home on any siding budget.